Choosing the place to stay while you are traveling. Buenos Aires is one of the cities with the largest options of lodging in Latin America. From big hotels (Sheraton, Amerian, Accor, Four Seasons, Hyatt) to small charming Boutique Hotels, Bed & Breakfast, Home Staying, Hostels and temporary rental, here you can find everything. 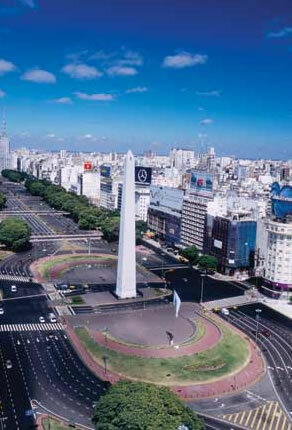 Not too long ago all the accommodation places in Buenos Aires where located downtown and few ones in Recoleta. Today it is possible to find first class possibilities in Palermo, Villa Crespo, San Telmo, Almagro, North Zone (San Isidro, Tigre, Pilar) and even some kilometers far away from the Capital City, which gave to the visitors a range of choices. Palermo is an excellent option because of the nightlife and safe environment as it is close to all the touristic points as well. It is a neighborhood divided in many "Palermos": Hollywood (Boutique Hotels, gourmet restaurants, beautiful cafés), Soho (alternative style, shopping zone, some hotels options, Bed & Breakfast, bars and restaurants), Viejo (old houses refashioned to petit hotels and underground (close door) restaurants), Botánico (barbecue places, smalls cafés and restaurants). Villa Crespo is the place for shopping with its outlets. Is is also starting to appear as a good place for small hotels and Bed & Breakfast. Almagro is perfect if you are coming to study Tango or Spanish, with the possibility of finding good Home Staying in good family houses. This is because you can train the language while living inside a real family as an exchange course. There are many different profiles and Buenos Aires has offers for everybody, in big number of prices too. The temporary apartments rental is another interesting accommodation choice. This has been growing a lot the last past ten years and today is a reality. The possibility of renting an apartment or house with all the amenities, facilities, luxury details, wifi, cleaning person, LED TV, and adding to this a combination of freedom to come and go where you want with who you want is very attractive. Prices are also important in order to chose and a hotel within same level will cost a lot more. Anyway, with all this possibilities for sure you are going to find the one that fits what you are looking for. The most important is to feel comfortable to enjoy Buenos Aires while you are here.